Pabanish (ON papa-nes = 'the headland of the 'papar'') which occurs in the place-names, Buaile Phabanais, Gob Buaile Phabanais and Traigh Buaile Phabanais, is a rocky headland at the south eastern corner of Little Bernera/Beàrnaraigh Beag (Fig. H10.1). Beàrnaraigh Beag is a small island, separated from the far larger, Great Bernera/Beàrnaraigh Mòr, to the south only by a narrow sound, 'one of the safest and most excellent harbours on this shore' (Ordnance Survey 1850-3, Original Object Name Books, Ross-shire, Book 41, 232). It must always have been intimately linked with Beàrnaraigh Mòr and it is perhaps this close relationship which explains its lack of prominence in earlier travellers' accounts of the area. 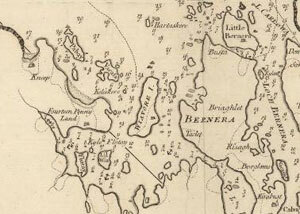 Beàrnaraigh Beag lies almost in the centre of Loch Roag (described in more detail with reference to H1), although as it lies to the north of Beàrnaraigh Mòr, it would have been far more accessible to any shipping passing along the west coast of Lewis. Like Pabaigh Mòr and Pabaigh Beag on the west side of Loch Roag, it would also have formed a prominent landmark from out to sea. Pabanish lies just to the south of Teampull Beàrnaraigh Beag, where the two chapels, Teampull Dhonain and Teampull Mhìcheil, recorded by Martin Martin (1703, 2003, 27-8), were located. However, the 'papar' place-name is not recorded until the arrival of the OS surveyors in the mid nineteenth century. In the OS Name Book, Buaile Phabanish is described as a 'small rocky hill' which is enclosed by a fence, presumably the boundary which is present on the OS First edition map and which appears to cut off the headland from the area around the chapels (Ordnance Survey 1850-3, Original Object Name Books, Ross-shire, Book 41, 210). All three Pabanish names incorporate the element buaile, 'fold', suggesting a more prosaic, but perhaps no less significant, role in the life of the island. Nonetheless, the existence of the three names (only two of which appear on the modern OS map) in such close proximity to the chapels, suggests a connection with the ecclesiastical site. Both Beàrnaraigh Beag and Beàrnaraigh Mòr are named on the earliest map of the area, that compiled for Blaeu's Atlas in 1654. Blaeu's map shows a single large building on Beàrnaraigh Beag, as does Mackenzie's map of 1776, but not until Heather's map of 1804 is the chapel identified as such (Fig. H10.2). The two chapels and the 'papar' place-names lie on the east side of the island, ensuring that they are visible from the settlements along the eastern shore of Loch Roag. As this means they face away from the Pabaighs in west Loch Roag, the name does not seem likely to be linked to them. The headland of Gob Buaile Phabanais would have acted as a landmark, guiding anyone approaching Beàrnaraigh Beag- particularly those seeking the chapels - from the sea. Besides this Keallasay lyis Berneray beg, ane half mile lang narrest, [ane] mile braid, ane laich roch Ile, full of little laich craigis and holvis betwixt, of naturall fertile earth, and infinite for wair on every schoir of the same. This Ile is well inhabite and manurit, and will gif zeirlie mair nor 200 bollis beir with delving only, perteining to McCloyd of Leozus (Monro 1549 (1994), 332). A large Island in Loch Roag which is about three-quarters of a mile from east to west and about half a mile from north to south and around which are several small rocks which make it very dangerous for navigators. It is one of the best Islands in Lewis the greater portion of it consists of good pasture for sheep and black Cattle. There were 12 families living on it at some period not very remote, there is a grave yard on the eastern side of it which is not enclosed. There is also a Fish House on its southern side, which is occupied by the Stornoway Merchants for the purpose of Curing Cod and Ling (Ordnance Survey 1850-3, Original Object Name Books, Ross-shire, Book 41, 233). Frame 121, taken 29 April 1988. Bernera Bheag is a fine picturesque island, hollowed into four or five soft grassy valleys lying north and south, the easternmost leading over to the Tràigh Mhòr-one of those lovely shore-slopes of pure sand so frequently met with along the western side of the Long Island (Muir 1861, 177). The north eastern half of the island is dominated by sandy beaches and the waters immediately offshore form a shallow lagoon, hemmed in by several small islands including Cealasaigh and Eilean Fir Chrothair (see below; Fig. H10.3). This half of the island appears far greener today than the much rockier western part, with its small shingle beaches, although all of Beàrnaraigh Beag is underlain by gneiss. 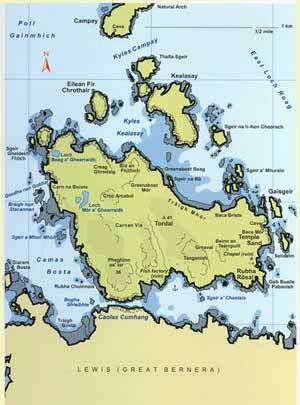 The eastern half of the island, with a higher incidence of machair, is far more fertile than the rockier western side. In terms of modern land classification, even the eastern part of Beàrnaraigh Beag is not capable of supporting more than rough grazing (class 6/1), though it is clear from aerial photos and from the OS First edition map (1853-4), that there are numerous enclosures, short stretches of walling and cultivation remains in the area around Teampull Beàrnaraigh Beag (Fig. H10.4). The Gaelic place-name element, buaile, linked to the name Pabanais, generally refers to a cattle fold, but it can also denote a sheep fold and, on Lewis, a pencil note added to the Name Book entry for Allt Buaile mhic Phersoin at Pabail, suggests that it can just mean a park (Ordnance Survey 1850-3, Original Object Name Books, Ross-shire, Book 41, 213; Book 75, 15). 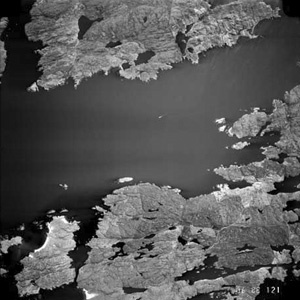 The majority of these folds are usually located around the shoreline and another, Buaile a Chràbhaidh, on Beàrnaraigh Beag has been translated in the Name Book as Devotion Fold (ibid., Book 41, 213). Rudha Rosal, the headland to the east of Buaile Phabanais and incorporating the ON word for horse (prob. hross-völlr = 'horse-field') is another indication of the importance of livestock in the economy of this particular island. The cultivation remains appear very clear on the sourer ground to the north of Traigh Buaile Phabanish, but much fainter on the machair which covers much of the east end of the island. These large areas of cultivation around the chapels suggest that it was a prime settlement area. In the post-medieval period, settlement was concentrated around the bay to the west of Tanganais, the best landing place on the island and the location of a curing house in the nineteenth century. 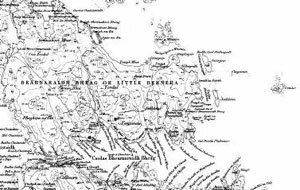 There are a number of Norse place-names on the island - Tordal, Tanganais, Arcabol, and Greinabost - the latter two incorporating the ON settlement element, bolsta?r. Given the amount of evidence around Loch Roag for Norse period settlement, it is highly probable that Beàrnaraigh Beag was occupied in this period, although no pagan graves have been found. The well-known song of Gealchos incorporates oral tradition which tells of links with Norway. Gealchos, who was the daughter of the young priest of Beàrnaraigh Beag, was taken to Norway by Swain, the Norse king of Lochlann, but she was so heart-broken at leaving the island that he felt compelled to bring her back (MacDonald 1967, 212-7). However, apart from a single oval building of smaller size, but similar form, to the megalithic house/cairn at Steinacleit, there are no indications of prehistoric settlement on the island (SMR no. 9696). A graveyard on a small sandy hill, in which there is neither vaults tombs or head stones, except one small enclosure on the east side of it about 3 feet high. This grave yard is not enclosed. Tradition says that there has been a Catholic chapel in this place but there is no trace of it now. Then the name the site and the character are all conjectural (Ordnance Survey 1850-3, Original Object Name Books, Ross-shire, Book 41, 209). Overlooking a smaller but equally beautiful traigh, at the east side, there is an open burying-ground, containing a few slabs, plain, but of ancient form ; and elevated on a rocky mount, close by, are some remains of the ground-work and part of the east wall of the chapel of St. Michael. Part of another chapel-that probably mentioned by Martin as having been dedicated to St. Donnan-was till not many years since standing on a lower part of the shore ; of it no traces remain (Muir 1885, 57). At NB 1505 4070 at the higher, S, end of the now disused graveyard, are the turf-covered footings of a chapel orientated E-W and measuring approximately 6.3 m by 3.2 m internally. Only the inner face is occasionally visible, and no structural details survive. Some 30.0 m to the NE on a low headland outside the grave-yard are the amorphous footings of an indeterminate structure, possibly the other of the two chapels mentioned by Martin. The graveyard, now being eroded, is full of graves, most of which are marked by head and foot stones (Information contained in NMRS record, following a site visit by OS surveyor, 22nd June 1969). (SC 1093049, taken 25 Sep 2005. In a tourist guide, dated 1932, it is reported that 'Here and there stone-built cells which formed the places of sepulchre are laid bare owing to the sandy nature of the soil' (quoted in Barrowman 2005, 39), while there is now a sea wall revetting the southern end of Traigh an Teampull (Information contained in Scheduling Document, 2004). Recently, the footings of the better preserved of the two chapels have been cleared out and the adjacent burial aisle repaired; during this process, Iron Age pottery was recovered from rabbit burrows and erosion spots near to the church (Information contained in SMR record, following a site visit by the Western Isles Archaeologist on 2 May 2002). The graveyard wall, which is far more clearly defined on the OS map in 1898 than when first surveyed in the early 1850s, forms a slightly irregular semi-circle, enclosing the low headland on which the remnants of the second chapel are located; the marked graves do not extend onto the headland itself (Fig. H10.5). Immediately to the south of the better preserved chapel, the nineteenth-century burial aisle of John Macdonald, with whom T. S. Muir stayed, straddles the graveyard wall and has been designed to look like a ruined chapel (Macleod 1997, 23). The two other, smaller, aisles lie against the inside face of the graveyard wall. The dedication to St. Donnan of Eigg is unusual in the Outer Hebrides, there being only one other - that of Cill Donnain on South Uist, at the opposite end of the island chain. From Muir's description, this appears to be the chapel on the headland, which Macleod, far more recently, notes is still sometimes known as Teampull Iosal, 'the low chapel' (Muir 1861, 177; Muir 1885, 57; Macleod 1997, 22). Macleod certainly believes that Teampull Mhìcheil is the chapel next to the Macdonald burial aisle. Local tradition suggests that Teampull Beàrnaraigh Beag formed the principal place of burial for the people of this area and it is possible that Teampull Dhonain was simply replaced by Teampull Mhìcheil. In turn, Teampull Mhìcheil at Ciribhig, on the north side of Loch Chàrlabhaigh, is believed to have replaced St. Michael's chapel on Beàrnaraigh Beag. 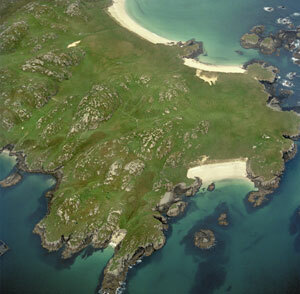 The difficulties of transporting bodies across to Little Bernera for burial led to the establishment of a temporary burial ground at Ciribhig, which later became permanent (Macaulay c.1984, 40-1; Barrowman 2005, 37-8, Site 12). On Beàrnaraigh Beag, it seems possible that the coffins would have been landed either on Traigh an Teampull or on Traigh Buaile Phabanais, though the existence of the place-name, Rudha nan Corp, 'point of the corpse', on the east side of the bay at Tanganais, suggests that this might have been the more usual landing place (Ordnance Survey 1850-3, Original Object Name Books, Ross-shire, Book 41, 227). Ordnance Survey, 1850-3 (1853-4). Ross-shire. First edition. 1:10,560. Sheets XI; XVII. Ordnance Survey, 1895 (1898). Ross-shire. Second edition. 1:10,560. Sheets 11; 17. Ordnance Survey, 2003. 1:25,000. Explorer 460 (North Lewis/Ceann a Tuath Leòdhais. St Kilda & Flannan Isles/Hiort agus Na h-Eileanan Flannach). Edition A. Ordnance Survey, 1850-3. Original Object Name Books. Ross-shire, Isle of Lewis. Uig. Book 41. NAS RH4/23/150. Institute of Geological Sciences , 1981. 1:100,000. The Outer Hebrides. Lewis and Harris North. Solid Edition. Soil Survey of Scotland. , . 1983. 1:250,000. Sheet 2. The Outer Hebrides. Land Capability for Agriculture. The Macaulay Institute for Soil Research Aberdeen. Soil Survey, The eastern half of the island is class 6/1, while the western half is class 6/3. The topographical nature of this 'papar' name does not inspire confidence that it relates to a 'papar' settlement. Nonetheless the associated ecclesiastical evidence suggests that it may have been linked to an early Christian site. It appears to be too far from Pabbay/Pabaigh Mor (H1) to be associated with that 'papar' island, but on the other hand it is unusual for two 'papar' sites to be so close together. The fertility which is commented on by Monro, along with the prominent nature of the headland as a landmark from the sea, resonates with the same features noted in many of the Pabbay/ Pabaigh and Paible sites in the Hebrides.